In music, a chorale prelude is a short liturgical composition for organ using a chorale tune as its basis. It was a predominant style of the German Baroque era and reached its culmination in the works of J.S. Bach, who wrote 46 (with a 47th unfinished) examples of the form in his Orgelbüchlein. The liturgical function of a chorale prelude in the Baroque period is debated. One possibility is that they were used to introduce the hymn about to be sung by the congregation, usually in a Protestant, and originally in a Lutheran, church. Although it was typically a polyphonic setting, the chorale would be plainly audible. There was sometimes an obbligato line above or below the melody. As an independent genre, the chorale prelude began with the works of Dieterich Buxtehude, 48 of which are listed as extant in New Grove II. Numerous examples also exist from the 19th and 20th centuries, including some by Johannes Brahms and Max Reger. Works in the form continue to be composed in the present day. Most of the chorale prelude form is a theme and variation with a "long A" where the voices retrograde, invert, imitate while following the original basso continuo. 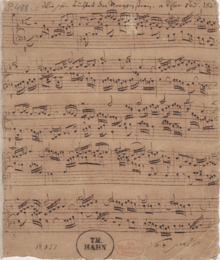 Probably, the earliest record of a melody used in chorale prelude by Johann Sebastian Bach is his arrangement of Gelobet seist du, Jesu Christ (BWV 604). This melody appears in a manuscript c. 1370, in the city of Celle. Later, it appears with an original text by Martin Luther, printed in the hymnal Eyn geystlich Gesangk Buchleyn in Wittenberg in 1524, edited by Johann Walter. In 1715, the hymn's book of Gotha, Germany, had already printed the melody of Gelobet seist du, Jesu Christ. 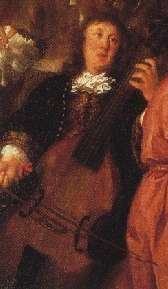 Soon after, in 1717, Bach was requested by the Duke of Saxe Gotha to present a musical passion. However, in a singular style, the chorale prelude first appeared in the works of Dieterich Buxtehude (1637–1707), and includes 48 extensive compositions. Besides Bach, Johann Pachelbel's music is of special importance, with many of his chorale preludes elaborating upon the Protestant melodies of Middle and Northern Germany. Chorale melody (cantus firmus) Wachet auf. There are several examples of 19th- and 20th-century chorale preludes, such as the Eleven Chorale Preludes by Johannes Brahms, Max Reger's and Samuel Barber's. Works such as these continue to be produced nowadays such as Helmut Walcha's four volumes and the seven volumes of Flor Peeters. In addition to Op. 79b, Reger also wrote 30 small chorale preludes, Op. 135a (1914). ↑ Williams, P. Bach Organ Music. London, BBC. ↑ [Barber, Samuel. Dei Natali (Chorale Preludes for Christmas), 1960. ↑ "Peeters: menu Organmusic". Retrieved 2009-03-05.